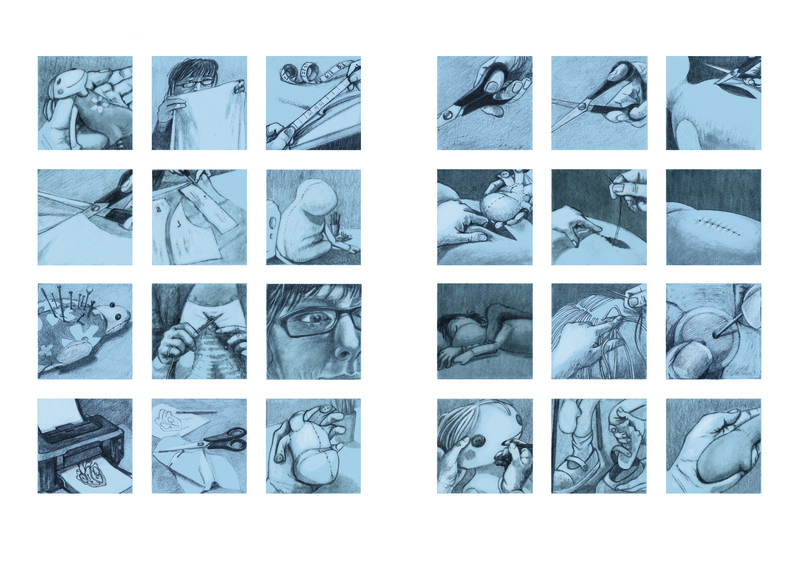 This work refers back to the wordless graphic novel style story that I worked on for my second semester of my first year on the MA. 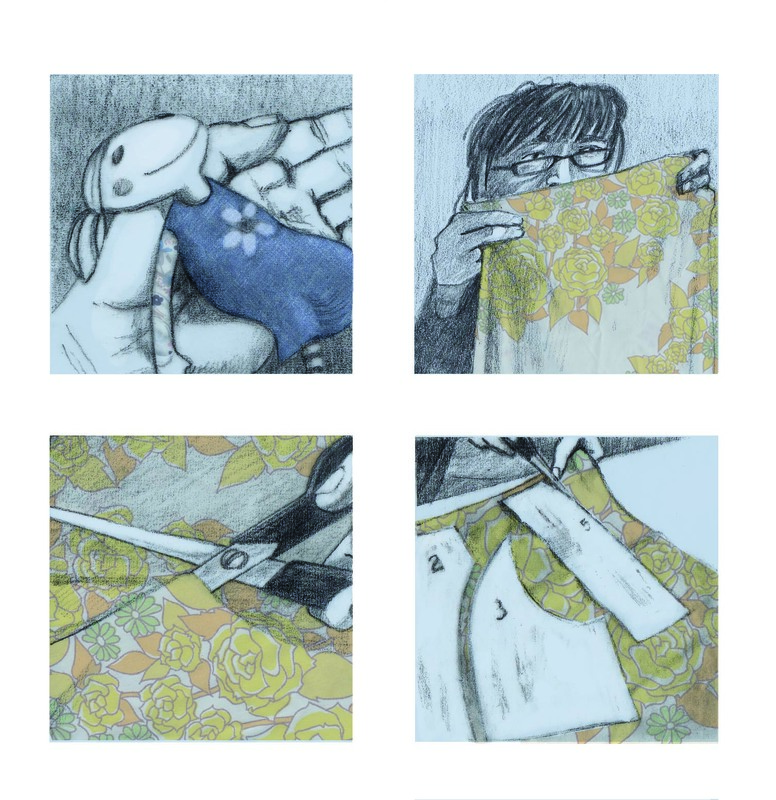 The project brief was ‘The Sequential Image’ and I chose to work on a story that developed from two separate incidents; spending time drawing in an old folk’s care home and also making a doll for Nikki Gamble’s Just Imagine Story Centre. Both of these I have blogged about previously, and here are the links: Just Imogen (Ingrid and Just Imagine), Semester 2 and Summer Progress. The Bologna Children’s Book Fair is coming up and I have decided I might be ready to promote myself there. 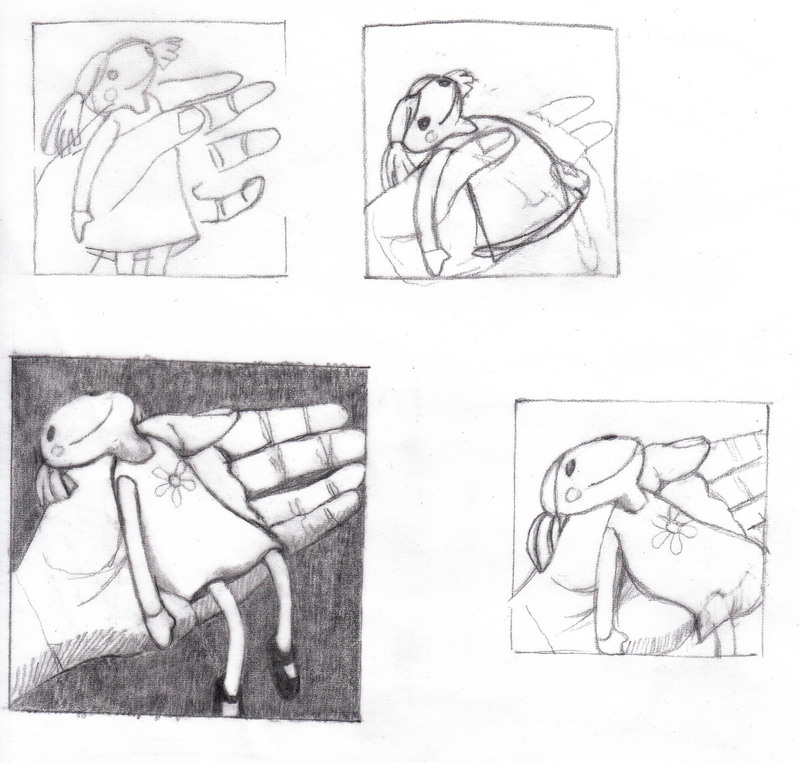 I have been meaning to draw this particular sequence from the graphic novel which I called ‘Big Doll’. In this story a family visit their aged relative in a particularly uninspiring care home. The children don’t want to go and whilst there they don’t engage with their nan. 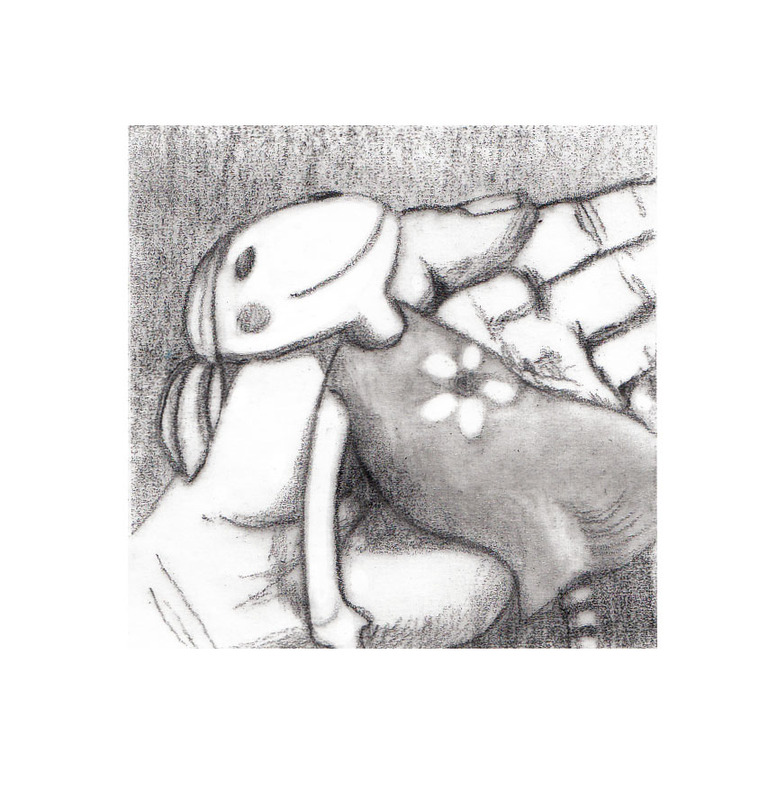 Later a worker in the home finds a lost doll and decides to make a larger version for the old folk. She brings it into work where the old ladies are delighted with it (dementia brings with it a sort of return to childhood). They treat the doll like an honoured guest and one night the doll comes to life. I won’t spoil the end, but you know, it’s a bit of a modern fairy tale I suppose. During the semester I was working on it I knew I couldn’t draw all the scenes in the time allowed, so I chose to concentrate on probably the most challenging scenes. I rapid-sketched the other scenes so there was a sense of the whole story. 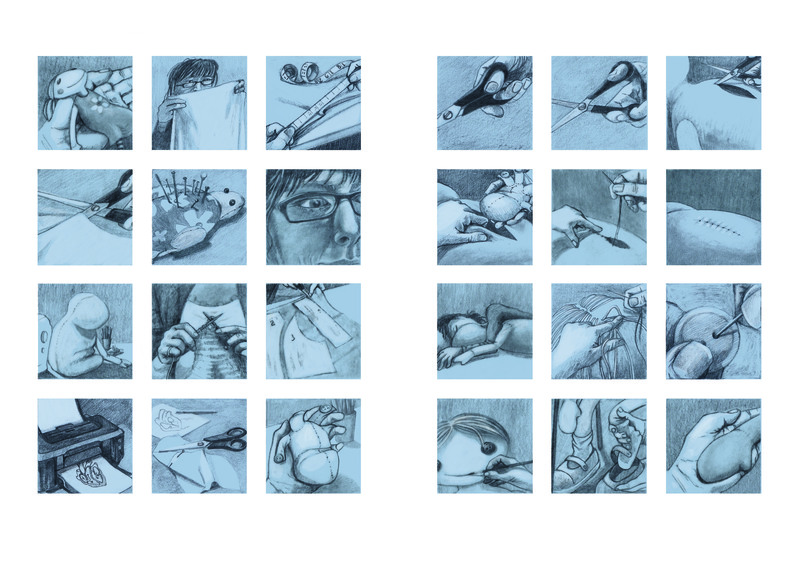 Using a limited palette of predominantly (sad) blue I tried and tried, drew and re-drew these challenging whole-room scenes. 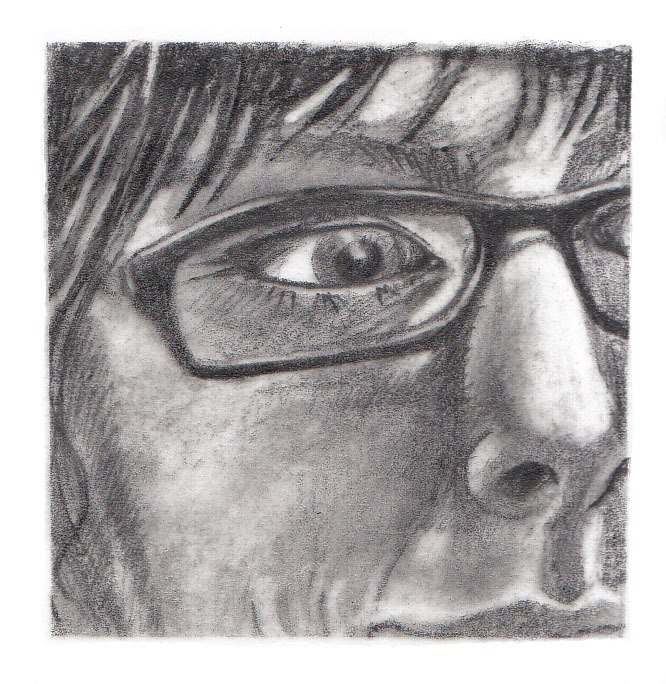 They didn’t work – I was disappointed that I didn’t ‘solve’ the problem of how to draw for this novel. If I’m honest, I still have to get to grips with drawing things in rooms (although I have an idea of how to progress with that – but that’ll be the subject of a separate post sometime). I very quickly dealt with the making part of the story and was a bit sad that I didn’t find more time to work on it. My original idea for the semester’s submission had been to only draw the big doll making process; in effect, illustrating something I had myself undertaken whilst producing ‘Imogen’ for Just Imagine. 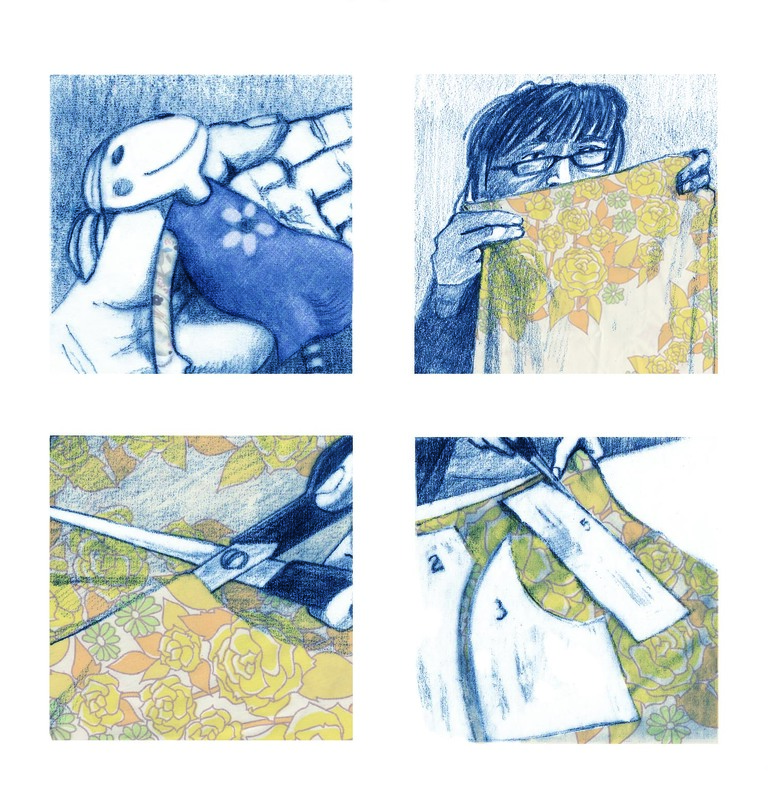 I decided to come back to this project for Bologna portfolio, aiming to demonstrate a certain versatility, and here is some of that process and the results so far. What I am mainly showing here are all the workings and re-workings of the same images. People often wonder what us illustrators do all day and here I think you can see that it’s a time consuming process. You can also see that getting it ‘wrong’ is part of that process. Nice but she looks a bit ‘alive’ already. She’s a doll, how is she standing up? Or what is she laying on? With the doll’s head being held it emphasises that she is a doll (and not yet alive). Although fairly pleased with it, I’m not sure it has sufficient clarity and the hands look a tad ‘meaty’. My main focus for sharing here has got to do with something – a concept not yet fully formed in my brain – something to do with really enjoying the drawing process. 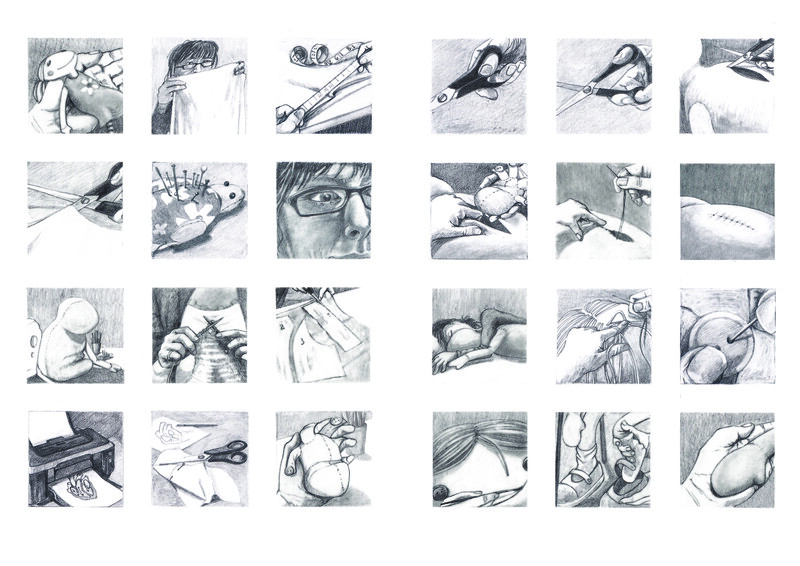 This past semester, whilst working on my penguin story (I still have to write about that), I have had several conversations around the issue of drawing. Basically it boils down to discovering how much I enjoy the drawing process and therefore allowing myself the time to really linger on that, perhaps even making it the main thrust of the kind of illustration I do. Not all illustrators love drawing as much – and I know that sounds mad – but some are more design based, or colour-orientated, or pattern obsessed, or graphic-based or something… I mean this is what makes us individual as an illustrator/artist. I just don’t love the colouring part as much as the working-it-out drawing stages. Prior to the MA I was struggling so much with the colouring part of producing an illustration, thinking because I found the colouring part so hard I had to concentrate more on that. I mean, yes of course one must attempt to overcome fears/weaknesses or else become limited (I will draw figures in rooms! I will!) but at the same time I have learnt that it is necessary to ‘play to one’s strengths’. I think an artist’s passion comes out in the work. I decided that I can allow myself to take time drawing, to really get into that part of the process. This particular method, being quite a careful and precise, might not be my usual way to work (do I have one of those?) but it seems right for this story. I recognise that it owes a fair bit to Shaun Tan, and oh, if only I were as good! The most important point here is that I have thoroughly enjoyed it, so far! I hope to have this as one of my A2 spreads and also in my portfolio for Bologna. I’d welcome your thoughts and feedback, as usual. 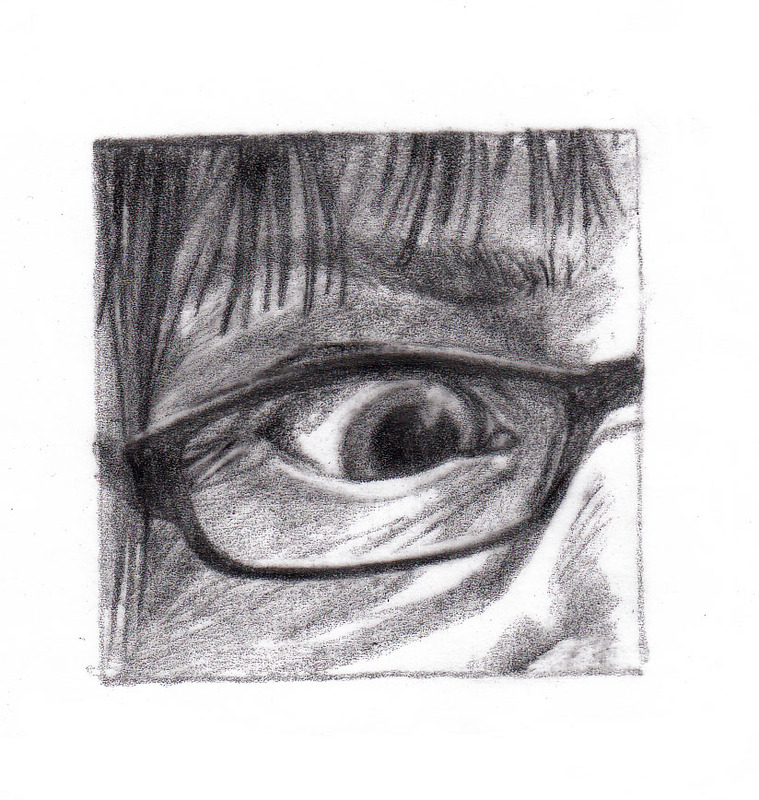 Too close – the eye, without some of the rest of a face (a hint of a smile) just looked terrified. 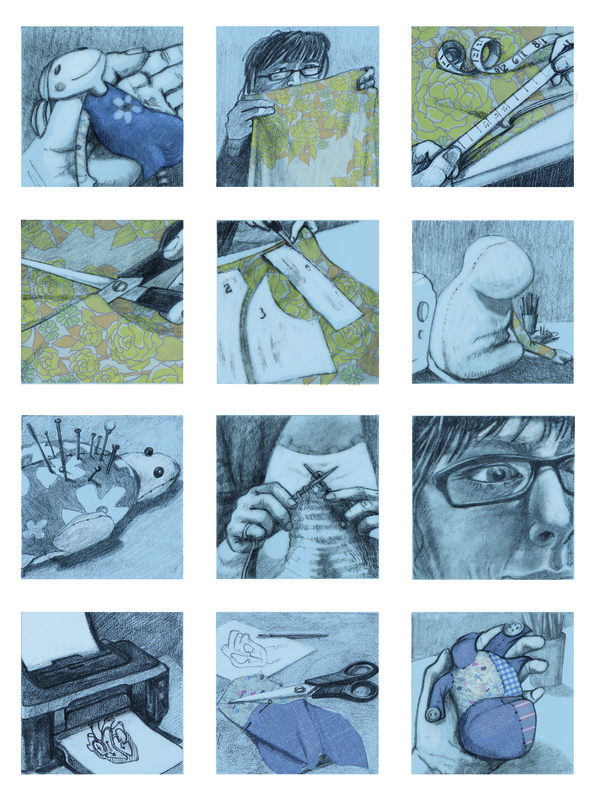 Just the drawing bits – note first painting face image in the bottom right-hand row, left side. The blue colour (I don’t like it much at this stage) is because the rest of the book is blue-tinged… well not ALL the book. Note a few tonal changes (trying to iron out some inconsistencies without redrawing a load) and a change of order on the left hand side of the page, in response to some feedback from fellow students. Also version 4 of the painting the smile on scene. More to come here because I plan to add fabric patterns and textures digitally. I am, however, getting the feeling that might not work and I’ll end up drawing them. Well, whatever – I’ll update this blog when I’ve done that bit. Oh – and I already have a plan for changes to the last image on the bottom right. You see – never finished. Someone take this away from me now, I need a cup of tea! Fabrics added digitally – I’ve not had much time to reflect on it yet. My initial response is positive, but that might change come the morning!